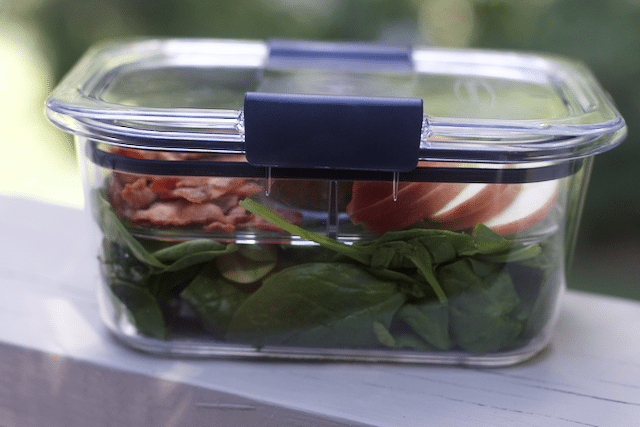 This is a sponsored post for SheSpeaks/Rubbermaid® about Spinach Salad Recipe To Take To Work Or School. No one likes a soggy salad for lunch, we now have the solution to keep all your ingredients for salad separated until you are ready to eat. 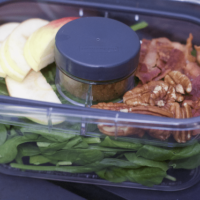 This portable spinach salad recipe is packed in the new Rubbermaid BRILLIANCE Salad & Snack Set for ease to avoid soggy ingredients. We had some fresh spinach in the fridge and adapted this Barefoot Contessa Salad that looked like an Easy Salad Recipe for lunch entree. Be sure to scroll down to the bottom of the post for a great giveaway of these food storage containers with lids! Your salad ingredients are all packed and ready for lunch and I bet your friends will be jealous over this simple salad recipe. 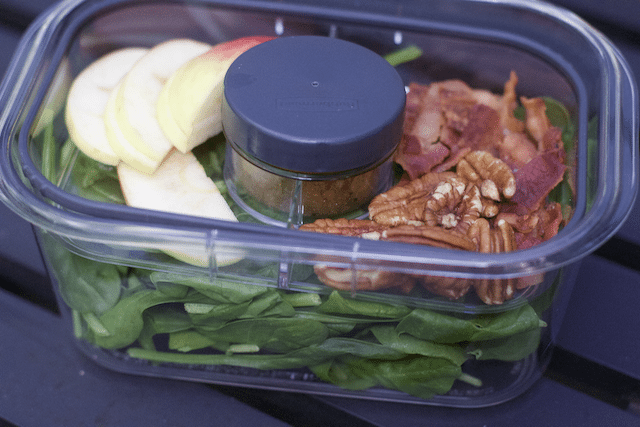 Any good spinach salad recipe is filled with fruit, nuts and of course bacon, but how do we get all of these salad ingredients to our destination without spilling the dressing all over our lunch bag. 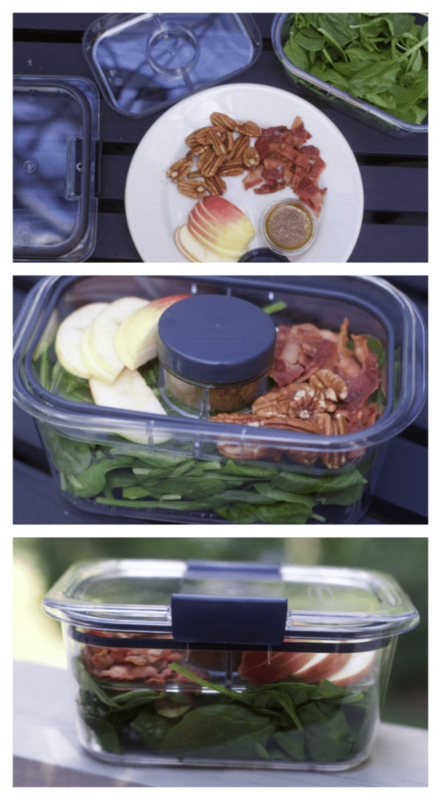 Check out the adorable little dressing container perfect for a salad for one. .
What I love about Rubbermaid BRILLIANCE Salad & Snack Set? 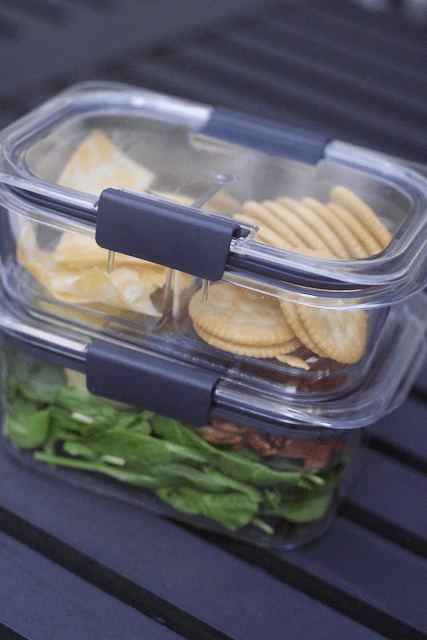 Rubbermaid’s pristine 100% leak-proof food storage container, BRILLIANCE, now comes perfectly designed for ready-to-go meals and snacks. With customizable insert trays and dividers, the BRILLIANCE Snack & Salad Set is a great way to pack a healthy salad recipe for lunch or work without worrying about it not tasting fresh. Customizable – You can interchange the containers depending on the ingredients for salad you are trying to pack. 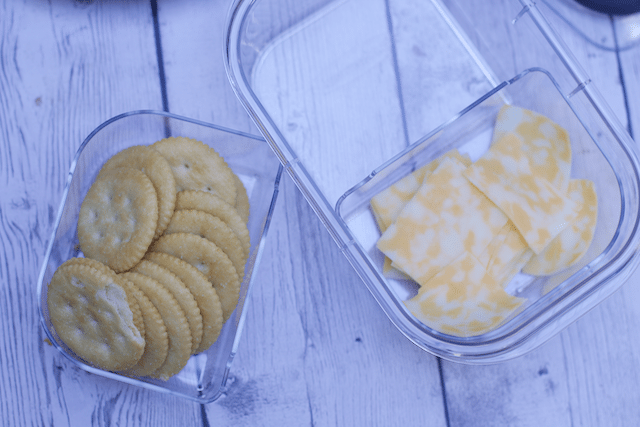 Now you are ready for your lunch too with a side of cracker and cheese slices that you can even share with your coworkers. 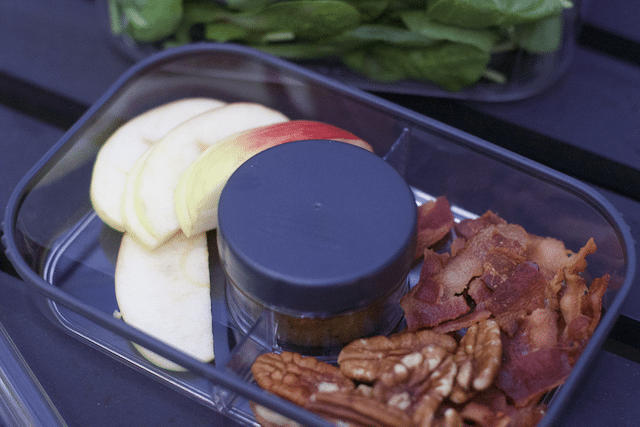 At serving time, just assemble the apples, nuts and bacon on top of your greens. This was an easy salad recipe for one and I would also have grilled or baked some chicken to make this more of an entree salad. 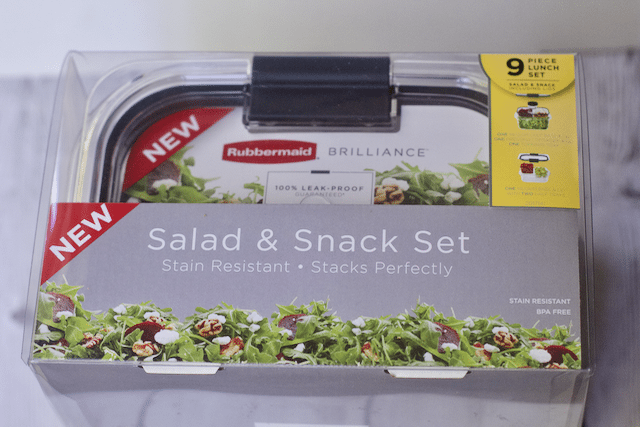 What is your favorite seasonal recipe that you’re bringing on-the-go in your Rubbermaid BRILLIANCE Salad & Snack Set? In a large bowl, toss together the Spinach apple, walnuts. Chop the bacon in large pieces and add it to the salad. Toss the salad with just enough dressing to moisten. Serve immediately. #StoredBrilliantly and #ad for all social sharing. 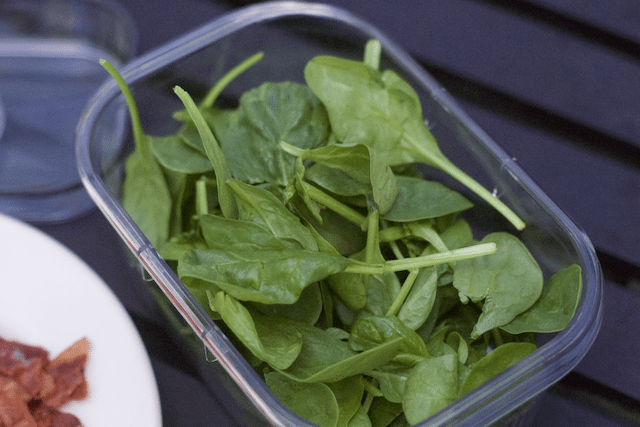 Get a set of Rubbermaid storage containers for yourself to make these spinach salad for yourself. I would love to pack a simple tuna salad. Thanks for the chance to win such an amazing giveaway. I would make a salad with French dressing. I would like a Caesar salad. I WOULD MAKE A COBB SALAD. I fix barbque chicken and shred it, then add baby spinach, diced tomatoes and cukes, shredded cheese as a lunch salad. I would like to make Chicken or Tuna salad! 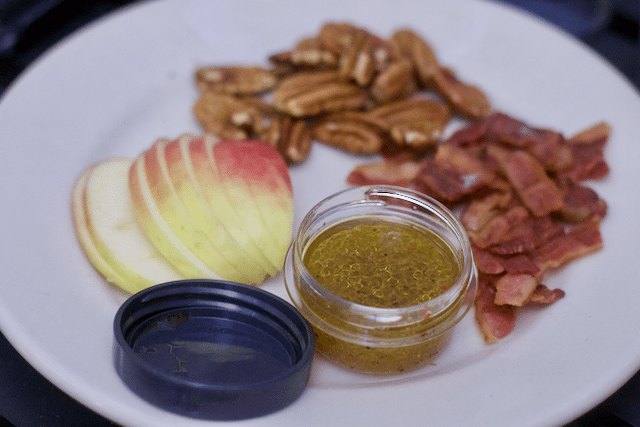 I would love to pack an Apple, Pecan Chicken salad. I love chicken casear salads! I’d pack a chicken ranch salad. This would be great for packing a southwest salad and keeping the tortilla strips from getting soggy. I am excited to pack an Asian salad for lunch with lettuce, bell pepper, water chestnuts, carrots and an asian dressing. I would pack a seafood salad with these for lunch. I’d love to pack a classic garden salad, with olive garden dressing! It would be great to have a fresh Cobb salad at work. I would pack my delicious Cobb Salad. Your link to your email does not work in the rafflecopter form. I can’t wait to pack a nice greek salad with feta cheese and black olives with this. I really like this container set. I would feel confident packing most any type of salad. My favorite has romaine. I would pack a chef salad. I’d pack a cobb salad. I’d pack a tossed salad. I’m thinking a fruit salad – pineapple, berries, melon, grapes – all the good stuff! Rubbermaid is a tried and true product. It makes me prepare my meals and give my refrigerator some organization. I’m smiling on the inside this is GREAT! I look forward to packing a fruit salad. I like a spinach salad with ham , cheese, bacon bits, and green grapes and ranch dressing. I want to pack a Cobb salad. I want to pack a fruit salad. I want to make this one! I also like the traditional spinach, egg, bacon and mushroom. That looks good! I pack grilled chicken salad sometimes! I will pack grilled chicken on baby spinach with dried cranberries and avacado. Thanks for the giveaway! Waldorf salads are the best now! My salads are romaine, tomatoes, bacon, cheddar and cucumber. I like to make a hearty salad with baby spinach, tomatoes, cukes, shredded cheese and baked chicken breast. This salad recipe sounds fantastic! I can not wait to pick up a few of these awesome containers so I can take one along while on the go without having to battle soggy greens or excess moisture. I really need some new containers and I love this one! I have bowls with no lids, lids with no bowls. It’s time to start fresh! Thanks for the ideas! I haven’t tried these particular Rubbermaid containers yet. I like the way the lid looks sturdy from being clipped down on the sides. What a great idea – a container that separates your salad ingredients so that they don’t get soggy! I need one of these! I am loving that little snack set, so cute and convenient! I need to get one. And I love all of the snack ideas!